With long beaches, fortified fishing ports, lush oases and the High Atlas Mountains, Morocco’s coasts and countryside offer plenty to interest travelers. 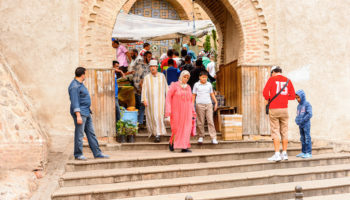 Throw in the imperial cities of Fez, Meknes and Marrakesh with their superb examples of early Islamic architecture, and you’ll understand why Morocco is a great travel destination. Meknes is one of the four Imperial cities of Morocco and its name and fame are closely linked to that of Sultan Moulay Ismail. The sultan turned Meknes into a impressive city in Spanish-Moorish style, surrounded by high walls with great gates. While Meknes is an imperial city with a lot of historical monuments and natural sites it is also the nearest city to the Roman ruins of Volubilis. In antiquity, Volubilis was an important Roman town situated near the westernmost border of Roman conquests in present day Morocco. It was the administrative center of the province Mauretania Tingitana. 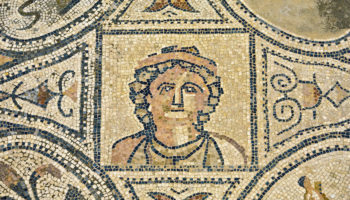 The fertile lands of the province produced many commodities such as grain and olive oil, which were exported to Rome, contributing to the province’s wealth and prosperity. The Romans evacuated most of Morocco at the end of the 3rd century AD but people continued to live in Volubilis for many centuries. Chefchaouen (or Chaouen) is a gorgeous mountain city in northeastern Morocco. 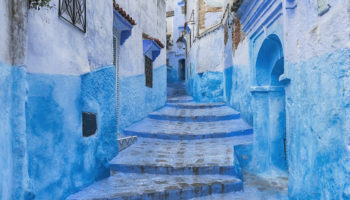 The picturesque medina, set against the dramatic backdrop of the Rif Mountains, is filled with white-washed homes with distinctive, powder-blue accents. 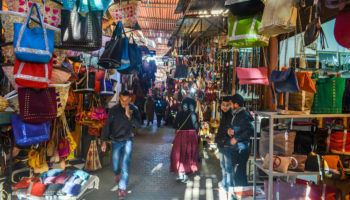 It is a popular shopping destination offering many native handicrafts that are not available elsewhere in Morocco, such as wool garments and woven blankets. The goat cheese native to the area is also popular with tourists. The region around Chefchaouen is one of the main producers of cannabis in Morocco. Hashish is subsequently sold all over town, but is mostly the domain of native Chaouenis. 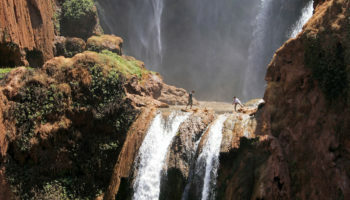 Todra Gorge is situated on the remote east side of the High Atlas Mountains. Both the Todra and neighboring Dades Rivers have carved out cliff-sided canyons through the mountains. The final 600 meters of the Todra Gorge are the most spectacular as the canyon narrows to a flat stony track as little as 10 meters (33 ft) wide in places with sheer and smooth rock walls up to 160 meters (525 ft) high on each side. 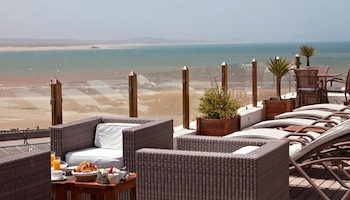 Essaouira is a relaxed fishing port, protected by a natural bay. It was formerly known, by the 16th century Portuguese as Mogador. The present city of Essaouira was only built during the 18th century to increase trade exchanges with the European powers. 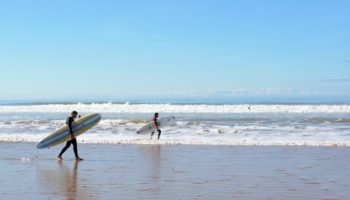 Nowadays, Essaouira is renowned for its kitesurfing and windsurfing, with the powerful trade wind blowing almost constantly onto the protected bay. Parasols tend to be used on the beach as a protection against the wind and the blowing sand. The medina of Essaouira is home to many small arts and crafts businesses, notably cabinet making and wood-carving. 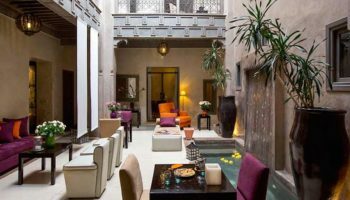 Located south of the High Atlas mountains, the stunning Draa Valley, lined with old Kasbahs, Berber villages and palm groves, spreads from Ouarzazate in the west to Zagora in the east. A drive through the valley is undoubtedly one of the most scenic journeys in Morocco. The Draa Valley is intersected by the Draa River which starts in the High Atlas and ends in the Atlantic Ocean, though in reality the river normally dries out before reaching the ocean. 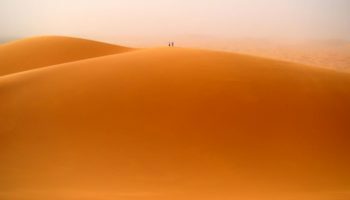 The Erg Chebbi dunes are located in the Sahara Desert. The awe-inspiring dunes are as high as 150 meters tall, and one certainly feels small in their shadows. Erg Chebbi special feature is its beautiful unique orange colored sand. Excursions to the dunes normally start from the village of Merzouga which is located on the edge of the erg. Camel trekking is the most popular option although it isn’t the most comfortable way of traveling. Fes-al-Bali, the larger of the two medinas of Fes, is a nearly intact medieval city. With a population of about 150,000 inhabitants, it is the largest carfree urban area in the world by population. Transports of goods is provided by donkeys, carriages, and motorbikes. The entire medina is surrounded by high walls with a number of historic city gates. 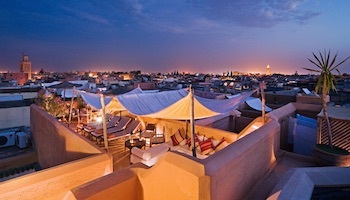 Several shops and restaurants have a rooftop terrace which is a great way to escape the bustling streets. The views are particularly spectacular during sunset and after dark. Aït Benhaddou is one of Ouarzazate’s fortified cities along the former caravan route between the Sahara and Marrakech. Inside the high mud walls are 6 kasbahs and a small number of homes. Most of the town’s inhabitants now live in a more modern village at the other side of the river although a few families still live within the city walls. Aït Benhaddou has appeared in several movies, including Lawrence of Arabia and Gladiator. 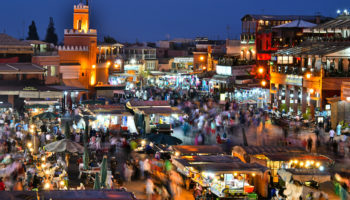 Djemaa El-Fna is the highlight of any visit to Marrakech and one of the top tourist attractions in Morocco. By day this square at the heart of the medina is largely filled with snake charmers and people with monkeys, as well as some of the more common stalls. As the day progresses the entertainments on offer change: the snake charmers depart, and in the afternoon and evening the square becomes more crowded, with story-tellers, magicians, and peddlers of traditional medicines. As dark descends Djemaa El-Fna fills with dozens of food-stalls, and the crowds are at their height. 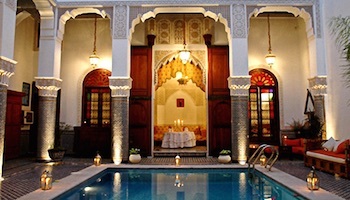 Morocco is truly a magical land, a paradise you will never forget. I am going on my 3rd visit and I can’t get there fast enough. Morocco is a good tourist country, everybody needs to visit the country once in his/her life time.